This year we're doing Thanksgiving cards. I've been a little busy this week so I asked the kids if they'd be willing to help me make the cards. They thought it sounded fun so I got to work this morning cutting out all the pieces. 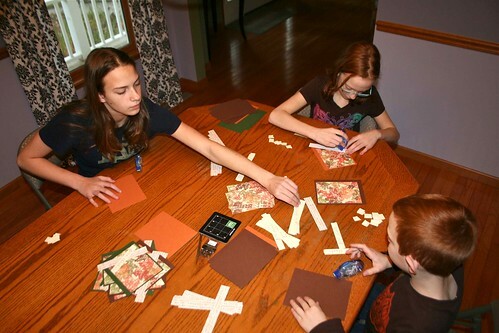 I had everything all laid out on the dining room table and called the kids in to help. I gave them a quick demo of what I wanted and let them loose. They did pretty good. I did have to fix a couple but let the others go. That's very good of me, in case you don't know me very well. That IS good of you! I'm impressed. And of course the cards look awesome!